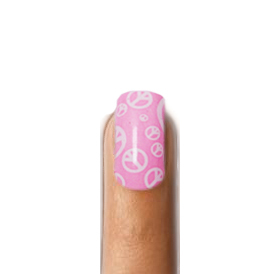 Peace Out Nail Polish Strips in baby pink with cute peace symbols. Says I’m all for world peace and I can rock it cute! Coveted Cosmetics nail polish strips take minutes to apply and lasts for up to 14 days if you take proper care of them. Stick them on, adjust position and you have salon quality nails in a flash! No more inhaling toxic fumes and no more waiting on nail polish to dry! Our nail strips are made with real nail polish. Comes complete with nail file and cuticle stick. The designs on them are detailed and crisp. Comes in a package of 20 strips in total, enough to do your fingers and toes! Removes easily with nail polish remover.